Varjak Paw is living in the city free of the restricted life he used to live as a kitten. Yet he finds the city and its cats are ruled by the fierce Sally Bones and her gang and she is out to get him. On the run, Varjak becomes an outlaw searching for a way to outsmart and out fight his enemy. Can his ancestor Jalal help him this time? With a fascinating array of characters from the loyal Cludge to the scary Scratch sisters and a gripping adventure, this is an exciting read. A book that will give you the chance to talk about what it means to be brave, loyal, fair, open-minded and stand up for what you believe is right. 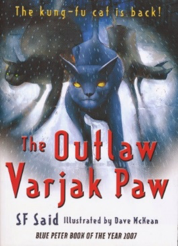 The Outlaw Varjak Paw won the Blue Peter Award in 2007. Discuss anything children wonder about; such as some of the vocabulary which may be unfamiliar, for example ‘outlaw’, ‘avalanche’ and ‘sewer’. Might Varjak’s dreams help him? Is Jalal trying to teach him something? You might like to look back at those bits and talk about them some more together. Which part of the story did you each see most clearly in your mind? Share thoughts. What rules should there be for the free cats after the end of Sally Bones? Any rules at all? What might be important? On a large piece of paper, A3 or bigger (eg back of a piece of wallpaper or similar) children could draw a chart of the characters in the story with annotations. Talk about the characters together. Which were your favourites and why? Make a small flyer to pin in the city (or around the house!) to tell all cats that Sally Bones’ reign is over, thanks to Varjak and his friends and they are now safe and free. In a large space children could try out some of the seven skills of Jalal eg slowtime, shadow walking, moving circles. (If children tried this with our activity ideas for Varjak Paw they might enjoy repeating this activity). Could you make a trailer using photos or drawings of cats?